After a rigorous evaluation of its ability to assess, diagnose and treat patients who may be experiencing a heart attack, St. Joseph has received Cycle IV accreditation by the Society of Chest Pain Centers (SCPC). St. Joseph now holds the highest level of Chest Pain accreditation in the area. Hospitals with SCPC accreditation have achieved a higher level of expertise in dealing with patients who arrive with symptoms of a heart attack. These facilities emphasize the importance of standardized diagnostic programs that provide efficient and more effective evaluation. They also provide more appropriate and rapid treatment of patients with heart attack symptoms. Cycle IV accreditation means St. Joseph provides the highest level of care for patients with heart attack symptoms, by meeting and exceeding the SCPC’s stringent criteria. Reduce the time from onset of symptoms to diagnosis and treatment. Treat patients more quickly during the critical window of time when heart muscle can be preserved. Monitor patients when it is not certain that they are having a heart attack to ensure that they are not sent home too quickly or needlessly admitted to the hospital. 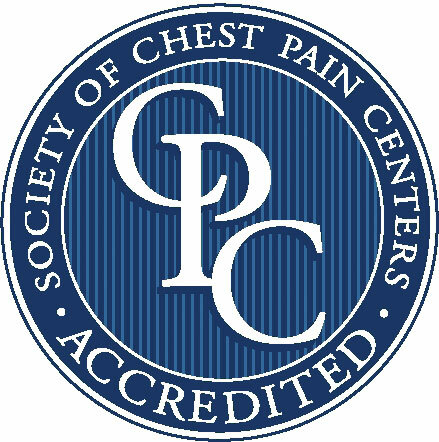 The Society of Chest Pain Centers (SCPC) is an international not-for-profit organization whose mission is to transform cardiovascular care by assisting facilities in their effort to create communities of excellence that bring together quality, cost and patient satisfaction.